After completing her degree in nursing Betty has worked in various places such as India and Middle East and gained expertise in Paediatric cardiac Intensive care unit. She then worked in a level 3 Neonatal unit at Homerton where she specialised in Neonatal intensive care nursing. During this time her key interest at masters level was to develop an online blended learning programme for nurses during their induction. 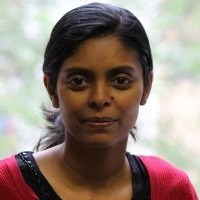 After joining City university, her focus was mainly in Neonatal continuous professional development where she currently leads the Neonatal CPD modules. Mathew, B. (2014). Using a social networking tool for blended learning in staff training: Sharing experience from practice. Journal of Neonatal Nursing, 20(3), pp. 90–94. doi:10.1016/j.jnn.2014.03.005 . Mathew, B.S. (2012). Evaluating the experience of using online blended learning during induction programme for nurses in a level 3 neonatal unit. Archives of Diseases of Childhood, 97(Supplement 2). Evaluating The Experience of Using Online Blended Learning During Induction Programme for Nurses in a Level 3 Neonatal Unit. (2012).